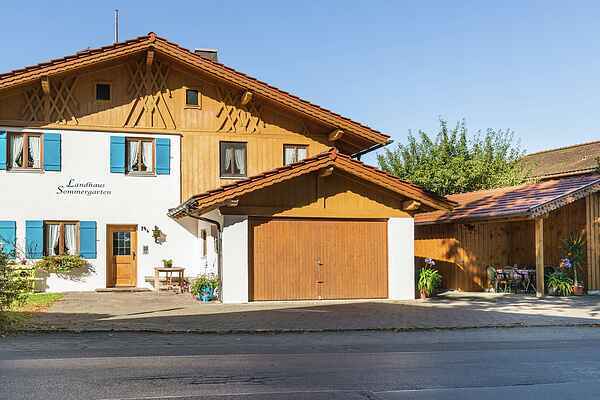 The town of Bad Bayersoien is set amidst charming countryside among meadows and marshes right on the picturesque Soier See in the heart of Bavaria and right at the gateway to the Ammergau Alps region. Whether looking for a spa holiday, a wellness holiday or an active holiday... this 'marshland spa town' is considered a popular holiday destination for all ages. Come spend your holiday in a quiet and sunny setting at the edge of town, just about 1 km from the lake. The holiday home is furnished in a country house style and offers a cosy ambience. You can grill and enjoy the sunshine in the garden. With its many sport and leisure options, the region has everything you could ask for in both summer and winter: swimming, cycling, mountain climbing, downhill and cross-country skiing, and much more. Pleasant and well-marked hiking trails will entice you again and again to explore the area's natural beauty. There are many sights and attractions nearby and throughout the region: Ettal Abbey (18 km), Linderhof Castle (27 km), Zugspitze (60 km), Neuschwanstein Castle (32 km), Wieskirche (12 km), the city of Munich (85 km), Oberammergau (15 km).